Scott Scovell on Visual FoxPro. For those programmer fathers out there, or humans who support someone or our very selves to live, which I think most of us do... we code not just for the challenge or for that ever-quench-the-thirst desire to solve things that tend to be abstract in an abstract way disguised in the form of for-loops, bits and 0101010001001s. We may be directly solving and creating systems, thinking of our clients needs but in the cubicle filled workplace of our minds, there is that space in the server room inside our craniums exclusively reserved for our needs, our families' needs and/or our children needs. But of course, there are also humans who are, let's say for the purpose of discussion... are from the start of their lives, financially and materially lucky. Almost everything are laid down at their feet. Now I'm not generalizing on the next line, but some of these lovely humans tend to lack 'TheDrive'. Again I am not generalizing all of them. It's just that time and time again I seem to encounter and interact with some of them seeing sparks of that tendency. I mean the tendency to lack TheDrive. If little forces lesser than TheForce tend to spoil someone or something with resources, it chips at parts of the inherent little drives that strive beneath, thus dissolving some good bits of the output. When the Wachowski was on a tight budget, they produced one of the best sci-fi, mind-challenging movies of all time, The (first) Matrix. Fast forward almost three years later, they have huge resources to produce bloated Matrix follow-ups. Some probably will include George Lucas and Star Wars in this list, but hey... the third episode was probably enough to save what the first two episodes lack (Well at least the first half of the third episode). In a way, FoxPro belongs to that make the most of what we have list. Not only is it a good resource-friendly product, it creates database applications, which if properly used, makes use of existing resources, however scarce they may seem... efficiently. Unlike other PLs that are so spoiled, bloated, hogs too much memory and requires system requirements above the roof... FoxPro uses what it really needs. Just as I was about to penetrate the coding zone after having a hell of a time freeing myself from the huge holiday hang-over, TheForce tends to display its mastery of randomly triggered events that somehow barfs me again out of the coding zone. Now the holiday-hang-over-excuse realm won't accept me anymore and I'm stuck in between this I-have-to-code-and-work-but-I'm-not-in-the-zone and the i'm-on-extended-vacation-i-can-justify-this-laziness sphere. Good thing I can blog. Anyway for the past few days, I've been receiving quite a number of client calls already, e-mails and sms-es, some of which even serve as my wake up calls (literally). It seems our clients are revving up faster than me. One of the differences between the corporate and the freelance kingdom perhaps. But inspite of these thing we were able to install one of our database systems (made in VFP9 this time (most current versions of our systems are done in VFP8)) to a new client, some details of which are the main reasons why I'm scribbling this while waiting for qs to finish using the bathroom (her bathroom usage tends to increase folds every year (and we're not even going to include the dressing up part)). Now back to the client I was talking about. Our proposal to them was submitted last October of 2004, got approved last December 2005, and a couple of days ago we installed the first system, the Human Resource modules. We need to further customize our exising Payroll System to cater to their needs and interface it with a bio-thumbrint TimeKeeping/DTR system, which will be installed by another IT company. The HR part is installed in four companies already (mostly schools and universities) so it is quite 'mature' already and needs no further customization. The Payroll System on the other hand is installed in one company, so I'm giving qs the responsibility of 'stabilizing' it. Remind me not to create a title for a certain blog before scribbling it. My title's supposed to be located seven degrees north and I'm heading the south in this blog. I will end this here and start a different blog on Visual FoxPro and the Developing Countries after this. I am supposed to update a link to Mike Lewis' article on How to install updated EXE files without forcing users to log out of your application which I blogged exactly two years ago... but decided to post a new one because there's more FoxSTUFF from that site since the last time I checked. Vizkorov... [a] Time travels fast [b] I really need to finish that FoxPro snippets/articles site links/directory I started two years ago and [c] VFP is on it's 9th version yet you can still use a lot of resources that were created before... and of course there are tons of 'shortcuts' already for those workarounds you are using a decade or so ago. Hosting a .NET ActiveX Control in Visual FoxPro and Registering the .NET ActiveX from SPS. Hmmm... no wordwrap on GridColumns..? ONLY headers are allowed to wordwrap..? I even tried adding a textbox and a label object inside the grid to simulate that Excel spreadsheet look on some fields but to no avail. Probably I'm missing something. As of 5:23PM of the 18th of January 2006, I'm a BLOG-first-before-finding-a-better-solution programmer. MY bloody pet bloody tiger bloody screams we bloody need bloody wordwrap feature on bloody grids. After months of searching, I finally found it. That's Top Cow's Witchblade 71. What I'm really after is Keu Cha's painted cover. 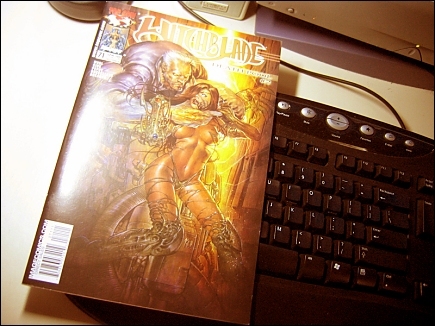 Keu Cha produces some of the best Witchblade covers along with the original artist, Michael Turner. Top Cow years ago deviated from the 'regular' superhero comics to delve into the supernatural world, which makes things more interesting. (But don't get me wrong, DC currently is doing well with its Infinite Crisis event and has been 'humanizing' their superheroes (producing even one of the best comic-to-screen-humanize-the-superhero-movie... Batman Begins)). But back to Top Cow... their take on the supernatural, sci-fi and conspiracy theories is what interests me most (and as of late qs is also reading them). PLUS of course their dedication to quality artwork on every panel. If you haven't checked out Witchblade yet, or have left it when Michael Turner wasn't the regular penciller anymore or if you've feeling it has become a T&A book years ago, do return and pickup a copy... Ron Marz and Mike Choi are doing a great job, delving into the police/detective/job side of Sara while still continuing its supernatural direction. Since Ron Marz handled things, it is receiving great reviews and even awards from various comic-related sites (which probably explains the reason why I'm having a hard time grabbing a copy of Witchblade 92). Ron Marz gives 'real' stories... not just stories that serves as an excuse or a reason for Sara's clothes to be shredded or to fall off. Ah yes... T&A stands for 'ti-- and asses', a term commonly used in the comics community. Admit it... you missed me.